create in the conduct of a real plant. Operator Training Simulator, dynamic process models. The increasingly sophisticated control applied to industrial plants makes more processesstable and subjecting operators to upset conditions or abnormal operation with lessfrequency. It is therefore increasingly important to use appropriate training toolsto acquire practice with the process through the behavioral simulationdynamic systems. control strategies used in the actual system. experiment with plant operating conditions that normallyremain unexplored. manage new installation configurations for revamping before startup. know the chain of events that caused plant blocks or conditions ofdanger. An OTS in principle should be with good approximation theactual plant behavior, should faithfully reproduce the operator interface andrepresent the operation of the emergency systems and security. The more or less faithful reproduction of the dynamic behavior of the process dependsthe complexity and accuracy of mathematical models that are used. With respect to the use that they must do, the Simulator can provide a simple representation of the trends of the process or can you describe in detail the system both in terms of breadth of answers that time constants. Typically simulation systems are based on financial statements of matter and energy and othermathematical formulations that describe the dynamics of the process.The mathematical models of processes and devices are parameterised so as to take into account the variability of the physico-chemical properties and geometry of the different sections of the system. 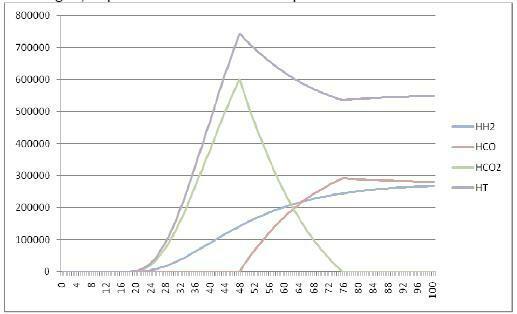 The tuning of parameters allows you to customize the templates to the system that you want to simulate. Theoretically you can make the answer more models next to the real plant, both tuning tuning parameters appropriately, that increasing the complexity of the models themselves. You on the other hand need to find the right compromise between accuracy and cost of development and maintenance. The training of operators to meet unusual conditions warrant, as well as ahigher level of security, also a reductions in system blocks and disruption atsystem; the highest operating continuity which consequently translates into economic savingscontribute to repay in the short term the cost of the simulation system. The Saras company researches and technologies and Wide Range have developed a system ofdynamic simulation of industrial systems for the training of operators (OTS-Operator Training Simulator) based on standard DCS platforms. The Simulator is built through the use of mathematical models to first principles, namelybalance of matter and energy applied to individual equipment and accompanied by appropriateempirical expressions that contribute to describe the dynamics of the process. To ensure adequate flexibility in the simulation system, it is designeda modular fashion: each module represents a single unit (heat exchanger, oven, storage tank, reactor, blower, compressor, distillation column reboiler, condenser, stripper column, etc.). The individual modules are assembled properly to represent the plant you want to simulate. The templates used for each module are parameterized with constants or tuning functionsto approximate the actual behavior of the process through atemplate tuning themselves. The accuracy of the simulation, and accordingly the complexity of mathematical models, depends on the degree of approximation to what the customer wants to reach. The calibration/tuning of parameters by means of a comparison with real dataplant. One of the elements of greater complexity in the tuning of models is the interaction between the different parameters of the simulation system: a good knowledge of the process and work closely with processisti and/or plant operators allow you to play with adequate approximation to the dynamics of the process. The model tuning operations are generally the most activitycomplex development of a simulator and require experience and long work times. A viable alternative, currently under study, is represented by tuning methodswhich are based on a comparison between the dynamics of real plant and that of the model,through the use of genetic algorithms. A good system of simulation, in addition to represent the dynamic behavior of theprocess, it must also reproduce with sufficient fidelity of intervention and emergency systemSecurity and, especially, the operator interface. For this reason it is believed that the most effective solution for the construction of an OTS isshould be based on DCS platforms use the same standard used to watchof the plant. The well designed simulation system typically requires one or two stationsoperator and control modules (hardware DCS simulation mode). Are not obviously needed i/o devices on hardware so identified are replicated all the control points that you want to simulate, with alarms and configuration of graphics pages that are used by operators in the control room. acquisition of existing points configurations of basic control loop andalarm system for the plant that you want to simulate. transcript on logic simulation system normally blockresidents of external devices (PLC). In the construction of models using only the standard control blocks andconfiguration tools or programming languages and characteristic of each controlDCS platform. The requirement of fidelity of the operator interface is resolved naturally withthe use of DCS standard hardware and loading the same graphical interfaces present inDCS control room stations. In this way those who use the Simulator is a system that is pretty much thephotocopy of the real one, with the possibility to work with graphic pages, operating groups, thedetail of pages, pages alarms, the trend of storicizzazioni process variablesand whatever you normally use in the management of the system. In order to design and customize a simulator it is critical to havein advance of a detailed specification describing the customer's requirements. In this specification should indicate the intended use of the Simulator; sectionsof the system to simulate; process variables that need to be simulated andwhat may be overlooked; the degree of loyalty that you want to achieve andespecially, accidental events that you want to simulate. It is normally provided for the construction of a graphic page in which the trainercan operate to introduce noise or generate emergency situations, such as sudden stopsequipment malfunction, accidental events or any other desired conditionrepresent. Once you define the degree of customization required to achieve the quality anddesired performance is normally requires a close cooperation between those constructsthe OTS and the experts of the plant process you want to simulate. In order to illustrate the salient features of simulation systems made, isdescribed below as developed for the most critical section of a catalytic crackerFluidised bed. The simulated process is preheating sections, reaction and regeneration of asystem of fluidized bed catalytic cracking. The system processes heavy distillates and residual distillation into light products of highest quality (such as high number gasolines octane rating). The charge is subjected to a first glow cycle through a series of trainsheat exchangers, the temperature of the charge output is a function of the distribution ofbring in several lines and configuration parameters of the exchangers. The second pre-heating cycle takes place in the coils of a furnace with a control ofoutgoing acting temperature by cross-flow adjustment of fuel andcombustion air, taking into account the air/fuel ratio and the amount of O2 in the flue gas. The Office, once heated, undergoes a catalytic cracking process tofluidized bed inside a riser which takes place, at a temperature of about 500° C, breakingof hydrocarbon chains and production of light distillates and coke, which is deposited oncatalyst. The result of the reaction is highly dependent on conditions in which takes place the same reaction. Disabling active sites caused by coke requires a continuous circulationcatalyst between the reactor cracked and the regenerator. 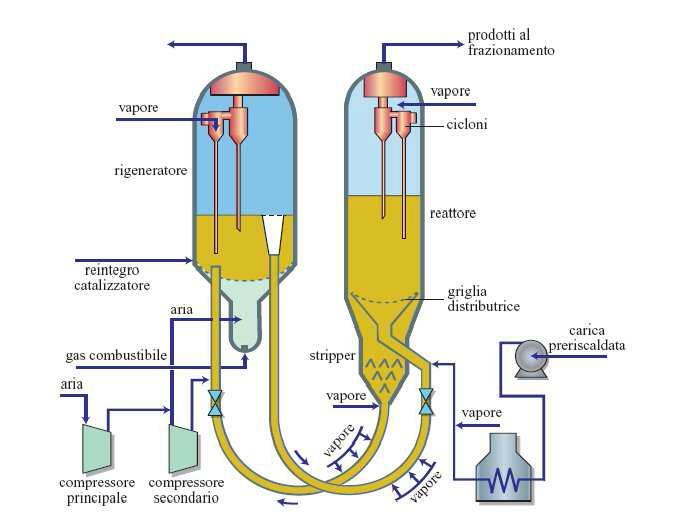 In the partial combustion regenerator of coke at temperatures of the order of700° c. The heat produced in the regenerator is tr asferito to the catalyst reactor and supports the endothermic cracking reaction that takes place in the reactor itself. In Figure 1 the following is a simplified diagram of the reaction and sectionsFCC plant regeneration. The first step of the realization of the Simulator was the mathematical modelling ofseveral sections of the plant. The complexity of the system has involved a carefulsimulation of unit using the budgets of matter and energy and empirical correlations can estimate the parameters representing the process [1-7]. The system has been developed considering different types of loads thatare fed to the system, in terms of physico-chemical properties. A variation of quality of loads can change significantly the course of cracking reaction and therefore the production of coke and thermal profiles in the reactor and regenerator. In simulation of heat exchangers and account was taken of the characteristicsconstruction of auxiliary fluid properties of the coefficients for individual tradingequipment. Have also been taken into account, where necessary, the curve characteristics of control valves, curves of pumps and compressors and the geometric characteristics of the system. The Simulator is able to perform real-time mass balances and energy inaccording to the trend of process variables. Have been reproduced the dynamics of actual process through the use of constant time, downtime and filters, as a function of the processes involved. Once the modeling phase, were loaded on DCSin simulation mode, the software configurations of points relating to the actual plant, withparticular reference to alarms and configurations of basic control loop. We proceeded then to the tuning process and parameters of regulators. Given the complexity of the system and the high degree of interconnection logic between the different sectionsthe plant, the most strenuous of the project was the tuning. Once this stage is passed to configure, block logic thatin the real system are made with PLCs. They then analyzed the causes-effects and were transferred into the simulator using the corresponding logical configuration. Finally, as a last step, you have configured all desired accidental events (block of pumps, compressors, valve block). The prototype of this Simulator made was subjected to examination and assessment of thefinal customer who has provided all the comments that led to the refinement of the system upthe realization of the ultimate Simulator. change the temperature regenerator using the flow control ofcombustion air. the temperature of the regenerator is kept under tight control by turning the flow of combustion air: small increments of quantities of Air Actthe conversion of CO to CO2 with a remarkable heat increasedof reaction (being the DH CO2 combustion equal to about three times that of CO). Furthermore, the stoichiometric air/C constitutes a process brittleness threshold, beyond which the system of regulation of temperatures has become unsuitable (entering a positive feedback), with subsequent loss of control. In Figure 2 shows the trend of the heat generated by combustion of coke inaccording to the opening of the slide valve that determines the amount of circulating catalyst. It highlighted the presence of three operating zones characterized by values of gain of extremely different process. You may notice that in the third zone, once the complete combustion, the gain of the system changes sign leading to, in case of exceeding the threshold, loss of control of the system. The Simulator described allows you to train the team member to handle the actual facility isin normal operating conditions, especially in abnormal conditions, which usually does nothas the chance to experience, stimulating in identifying appropriate actions promptly tobring the system to the desired target following an anomaly. It also allows you to represent the chain of events resulting from any process or perturbation maneuver of the operator (variation of the set point and loop modes) and familiarize yourself with the consequent alarms activation sequence. exhausted to the regenerator; at the same time there is a reduction of the amount of cokethe regenerator and an increase in temperature of the regenerator itself. To return the system to the initial temperature, the control system intervenes by reducing the air flow supplied to the regenerator. In stationary conditions the two reactors return to set point. The use of the Simulator allows, for example, to test the effect of changes incharge, quality of valve blocks, exchangers, malfunctions of a stopa sudden charge pump, an oven or a blocking of compressors that sendthe air at the regenerator. It also allows you to explore areas of operation is generally not used and check in first approximation which are the operational limits of the system. In relation to the client's needs, you can insert in the simulation systemdistinctive elements of the simulated system (such as characteristic curves of valves, duty ofheat exchangers), simulate block sequences, start-up or shutdown, introduce appropriate complaintsprocess through the use of a graphics page for the trainer. 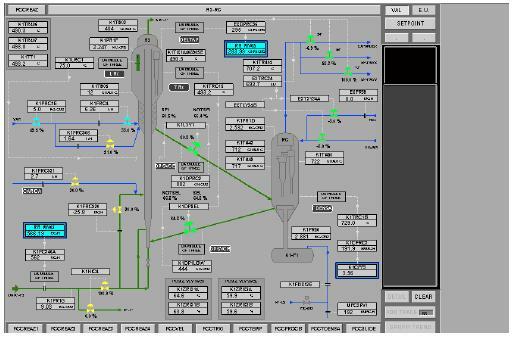 In Figure 4 is an example of a graphical page imported into the Simulator,quite similar to the one used by the operator in the control room. Simulation systems OTS made are used to represent with goodapproximation of actual plant behavior. They are based on mathematical models that can be customized according to customer needs by reaching the desired level of detail. The modular design Simulator allows you to have high flexibility: in relationcustomer's needs it is possible to up-grade the next intended to further improvethe accuracy of the simulation, increasing the complexity of the mathematical models and refining theparameter tuning. Each simulation system is built by loading on the DCS mode platformsimulation of software configurations on the real system, with particularreference to alarms and configurations of basic control loop. Use the same standard DCS platforms used for plant controlreal hardware that provides a graphic interface identical to that of the operations console. You can also insert special graphics pages for the trainer to introduce proper complaints process. On request, we can also provide additional features like inserting newequipment, systems of representation, block the simulation startup sequenceand stop the system. Fig. 2: Trend of the heat produced in the regenerator depending on the amount of catalyst circulating, with the same amount of air available.